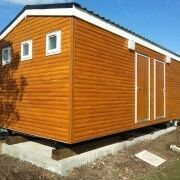 If you own a campsite in the UK and are looking for a mobile toilet block or shower block, why not contact us today? We have the experience and knowledge to make sure you get the best solution for your campsite with options for portable toilet units, mobile toilet blocks and shower blocks. We can replace existing mobile toilet blocks or design from scratch, and we can also advise on groundwork and mains connectivitiy and as you can see from our examples, we have the know-how.